There's a new review on the site today. It's for the next Doctor Who DVD, the acclaimed Tom Baker story City of Death, which is released next week. The story was written by the late Douglas Adams, and features Lalla Ward, Julian Glover and Tom Chadbon. The disc is very impressive, as you'll discover if you click on the sleeve image, right, or here. Gus Van Sant's Last Days will be released by Optimum Releasing on January the 9th. The film, which charts the demise of a troubled Seattle-based rock star, stars Michael Pitt (as the Kurt Cobain-like Blake), Lukas Haas and Asia Argento. The disc will feature an exclusive interview with Pitt (filmed in London); a Making of... featurette; something called On The Set of Gus Van Sant's Last Days: The Long Dolly Show; a music video; a deleted scene; and a trailer. The film will be presented with a Dolby 5.1 track. No other technical specifications were announced. The RRP is £19.99. 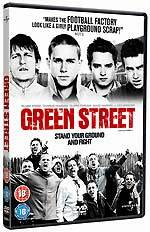 Lexi Alexander's recent film about football hooliganism, Green Street (know in the US as Hooligans) will be released by Universal on December the 26th. The film stars Elijah Woods, Charlie Hunman and Hustle's Marc Warren. Bonus materials on the disc will include From Hobbit To Hooligan (an interview with Elijah Wood); Standing Your Ground - The Violence of Green Street; A Clear Direction (Lexi Alexander talks about her inspiration); The Making of Green Street; One Blood music video; and UK and US trailers. More details will follow. 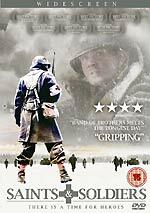 The critically-lauded WWII drama Saints and Soldiers will be released on DVD by Metrodome on January the 9th. The film, about five American troops trapped behind enemy lines, has won thirteen international awards, including the Audience Awards for Best Picture at the San Diego Film Festival, the Sacramento Festival of Cinema and the Long Beach International Film Festival. Bonus features on the disc include a director's commentary and The Making of Saints and Soldiers featurette. (If they're the same as the US disc, the commentary track will be by the director, producer and screenwriter, and the Making of... featurette will be twenty-two minutes long). The disc will have English HoH subtitles. No other technical spec's were available. 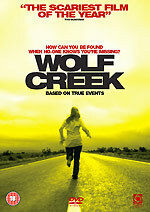 The teenagers-stalked-in-the-outback movie Wolf Creek will get a DVD release courtesy of Optimum Releasing on January the 16th. The film will be released on a two-disc set. The film is on disc one, along with an audio commentary "by director Greg McLean, the producer and cast". The film will be presented with a Dolby 5.1 track. No other technical specifications were announced. The second disc will feature cast and crew interviews; Meet Mick Taylor (an interview with star John Jarratt); a Making of... documentary; and deleted scenes. The RRP is £17.99. The Incoming page has been updated a bit, with some new changes to Universal's TV box set schedule, revised Network dates, and a few other minor changes. All the releases that were supposed to come out today have been checked against a couple of etailers, to see if they're still expected today. 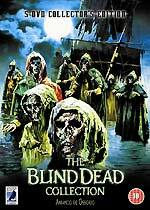 Full details of Anchor Bay's The Blind Dead Collection DVD box set, which is due on the 14th of November, are now available. The five-disc set offers all four films in Armando De Ossorio’s series about the sepulchral Knights Templar: Tombs of the Blind Dead (La Noche del terror ciego), The Return of the Evil Dead (El Ataque de los muertos sin ojos), The Ghost Galleon (El Buque maldito) and The Night of the Sea Gulls (La Noche de las gaviotas). As with the American Blind Dead Collection set, which was released recently by Blue Underground, each film has been digitally re-mastered using new high definition source material, and each film offers a variety of Dolby Digital and DTS audio tracks. So far, so good. The Blue Underground version has some significant advantages over the Anchor Bay edition: it features the uncut and edited versions of Tombs... and Return..., and offers a choice of English and Spanish audio tracks for Ghost Galleon and Night of the Sea Gulls. The UK set does not include the Spanish language tracks for these films. The UK version of Tombs of the Blind Dead has been cut by sixteen seconds by the BBFC, for "eroticised sexual assault". Compared to the VHS version released a few years ago by Redemption, the film got of lightly this time. There's a discrepancy between the running time of the DVD (or, at least, of the review DVD I was sent), and the official running time given by the BBFC, though, which I've not been able to reconcile. The BBFC say the film now officially runs for 97'08" (after cuts), but the review disc runs for 96'51". Both sets include a bonus disc, which features a Spanish documentary about De Ossorio, The Last Templar (25m, with English subtitles), which contains clips from some of his earlier films; and an interesting, if lo-tech, video interview with the director, titled Unearthing The Blind Dead (11m - titled Unearthing The Blind on the UK review disc). A DVD-ROM feature called Farewell To Spain’s Knight of Horror turns out to be a PDF version of an article from Shivers magazine, published shortly after De Ossorio’s death. Other bonuses include trailers, TV and radio spots, poster and stills galleries, and a hilarious alternate title sequence for Tombs of the Blind Dead, which was added to the film to attempt to pass the film off as one of the Planet of the Apes films, Revenge of Planet Ape! Both sets also come with a revised edition of Nigel J. Burrell's lavish forty-page fanzine about the series, Knights of Terror. Here the UK edition scores some bonus points: their version is in full colour throughout. Despite its drawbacks, the Anchor Bay set offers a tempting alternative to the Blue Underground edition, especially considering the price difference (at £29.99 it's substantially cheaper). A selection of menu screens from the Anchor Bay set can be seen here. Twentieth Century Fox Home Entertainment will be releasing two 40th anniversary editions of The Sound of Music on November the 28th. There'll be a single-disc Sing-Along Edition, and a two-disc 40th Anniversary Collector's Edition set. Both will offer the film in a new fully-restored version of the film, with optional new karaoke-style singalong subtitles, and a specially-created lyric booklet. 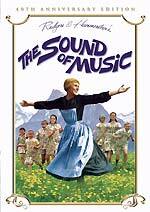 The two-disc edition features introductions on both discs by star Julie Andrews (4m total); a documentary, My Favorite Things: Julie Andrews Remembers (sic) (63m); a cosy chat with Julie Andrews and Christopher Plummer, titled A Reminiscence (20m); On Location With The Sound of Music (23m); From Liesl To Gretl: A 40th Anniversary Reunion (32m); When You Know The Notes To Sing: A Singalong Phenomenon (12m); Biography - The Von Trapp Family: Harmony and Discord (46m); Mia Farrow's Screen Test (33s); a Restoration Comparison (6m) and stills galleries. There are two commentary tracks. The first is by the director, the late Robert Wise. The second, titled the Production Commentary, is billed as featuring stars Julie Andrews and Christopher Plummer, but it also features Charmian Carr (who played Liesl), choreographer Marc Breux, and Johannes Von Trapp, son of Maria Von Trapp. The film is presented in 2.2:1 anamorphic widescreen format, with a choice of 2.0 or 5.1 (at 448kbps) Dolby Digital audio tracks. The disc will also have English HoH subtitles. RRP for the Sing-Along version is £14.99; the Collector's Edition is £22.99. A Roobarb's DVD Forum thread discussing the new release can be found here. Menu screens from the Collector's Edition can be found here. Expect a review soon!